Cubase SX3 takes music production to a new level by adding more than 70 new features including powerful Audio Warp Realtime Timestretching, an intuitive Play Order Track, convenient Inplace Editing and many new editing functions. With Cubase SX 3, a native music production system combines full-featured audio and MIDI recording and editing, virtual instruments and powerful audio mixing with the added flexibility of loop- and pattern-based arranging and mixing. Audio Warp: Realtime Time Stretching and Pitch Shifting offer extensive new audio editing and processing capabilities, including ACID® File support: loops automatically adopt a project's tempo; audio files can follow tempo changes in realtime. Intuitive Play Order Track for pattern-based arranging adds a new level of creative music editing. Divide your song into sections, and then re-arrange it on the fly. 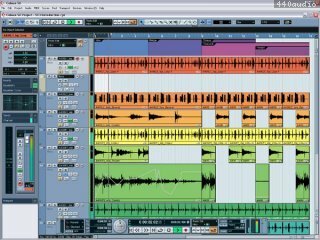 Compare alternative versions of your song and then convert them back into a linear form for mixdown and mastering. New Inplace Editor supports ultra-fast direct MIDI event editing from within the project page. Edit MIDI events in context with audio or video. New MIDI Device Maps / Panels support direct access to external MIDI hardware with user-definable graphic editing panels. Import VST Mixer Maps or create your own editing panels, even for the Track Inspector or the mixer's channel strip. User-definable Workspaces (window layouts) help organizing your desktop. Create and save a separate workspace for each step of the production process. Switch Workspaces on the fly, as if working on multiple computers or monitors. Studio Connections "Total Recall" support (optional integration of Yamaha's Studio Manager 2). The first step into a new dimension of software/hardware integration. This modular editing system builds a powerful bridge between the virtual and physical studio. Opening a project can recall an entire studio setup within seconds. External FX Plugins allow for direct integration of external hardware effects processors into the VST audio mixer. Use your favorite outboard gear just like plugins – including automatic delay compensation. Extended Freeze function for virtual instruments and audio tracks with added flexibility and improved performance. Freeze virtual instruments with or without insert effects. Then automatically unload the instrument to free up RAM. Freeze audio tracks with insert effects to free up even more CPU performance. New part-based Volume Envelopes for direct control of dynamics. Fix level problems on the fly without wasting automation tracks. Then move events with their volume envelopes. 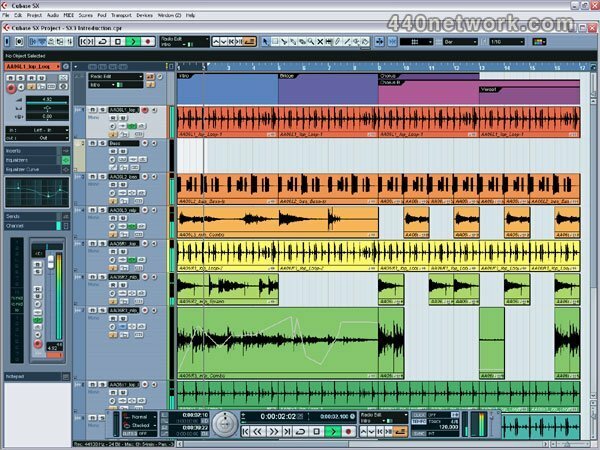 User-definable Color Coding for tracks and VST mixer channels provides more clarity and better orientation – especially in complex projects. I've got Cubase 4 full version and I wanted to try out the SX3.1.1 trial version (as this SX3.1.1 was used on my recorded work in the UK by cave studios)...I now have the project with me so I wanted to check out the plugins. Tres bon soft , surtout pour les compositeurs (Les ingé-son prefereront surement Protools 6). Il manque encore quelques petites fonctions mineur mais l essentiel (et meme plus) est la ! Le midi et l audio sont tres bien geré ... des fonctions permette d utiliser beaucoup d instru VST en meme temps , l integration rewire est parfaite et le moteur audio est exelent . Avec cubase on travail rapidement et efficassement , et l informatique ne vient pas gener l inspiration . Cubase , un bon sampler (HALion3 ou Kontact)quelques instrument Vst et vous voila avec un veritable studio virtuel .